Trees are a power line’s natural enemy. While trees provide beauty and shade to our homes, those planted too closely to power lines can create public safety dangers and reliability problems. Tree limbs contacting power lines cause dozens of electrocutions each year in the U.S., shocking people climbing trees, homeowners and professionals trimming trees, and bringing down lines that contact people and animals on the ground. 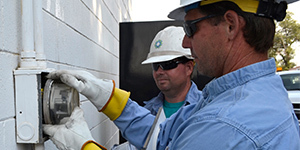 Reliability hazards include fires in trees and electrical equipment, as well as ‘blinking’ lights caused by limbs touching wires, and outages caused by falling limbs. Chris Plante, Foreman with Solida Tree Service of Phillipsburg, trims branches away from power lines in Hays. Central and western Kansas have less dense tree populations than other areas of the state, so tree-related outages are less common. But that doesn’t mean we’re immune. A powerful windstorm on July 13, 2016 swept Ellis and Russell Counties with 80 mph winds, downing hundreds of trees and dozens of electric service lines from alleys into homes. Tree limbs were pushed into power lines, causing fuses and transformers to blow and outages for thousands of customers. 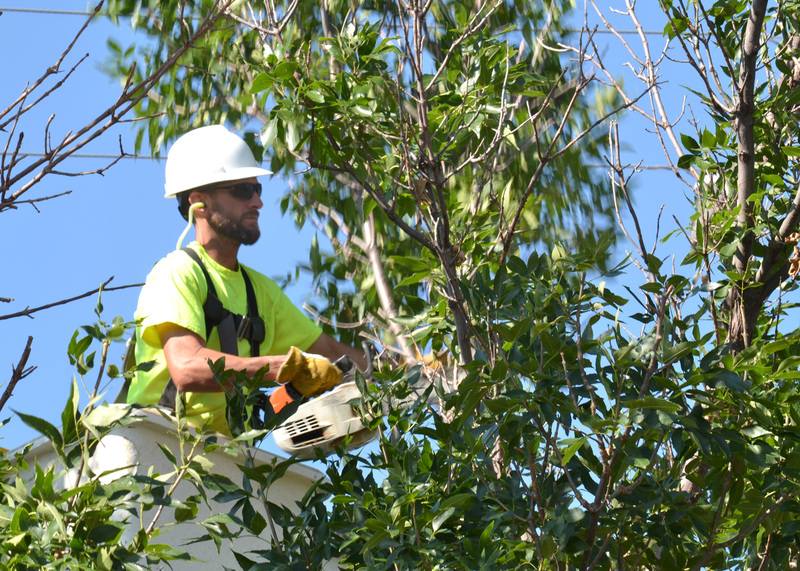 To ensure public safety and system reliability, Midwest Energy invests heavily in tree trimming, spending more than $850,000 each year to trim trees throughout its 26-county electric service area. In addition to reducing tree-related outages, regular tree trimming helps reduce wildlife-related outages. 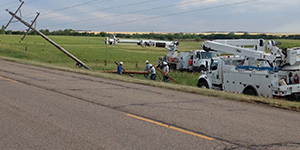 Taylor said that Midwest Energy is responsible for maintaining line clearance along lines running from pole to pole in streets and alleys, within the company’s easement. Taylor said under Kansas law it’s illegal for unqualified persons to be within 10 feet of power lines. 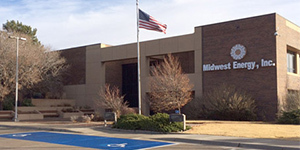 “If a homeowner wants to trim trees near their service line from the pole to their house, they should contact Midwest Energy, and we’ll take down that service wire while they trim their trees back,” Taylor said. 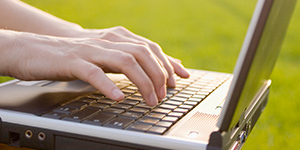 Homeowners are responsible for removing any debris from trimming they perform. Taylor said Midwest typically uses professional tree trimming crews from Solida Tree Service of Phillipsburg, who use specialized equipment and techniques to safely trim trees near energized lines. Solida employs trained arborists, who attempt to trim each tree in a manner that minimizes impact on the tree. If you have any questions about Midwest Energy’s tree trimming program, or if you feel trees on your property have grown too close to power lines, call Midwest Energy at 1-800-222-3121. 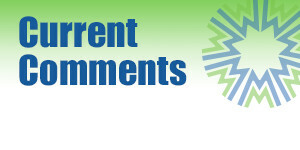 For more information, visit www.mwenergy.com > Community > Safety > Electrical Safety.